Dr. Sara is a dentist your whole family will love! She is gentle, kind, patient and compassionate. Dr. Sara is dedicated to excellence in every area of life. She welcomes patients of all ages. Children especially love her humor and her ability to make a dental visit an enjoyable experience. Dr. Sara offers cosmetic dentistry, TMJ and Sleep Apnea therapy, implant restorations, prosthodontics, and pediatric dentistry. Her work incorporates the latest technologies and procedures with state-of-the-art diagnostics. Being a graduate of the University of Missouri, School of Dentistry, in Kansas City, Dr. Sara practiced privately in Missouri before finding her way to Arizona. Once here, she rooted herself, finding Pinnacle Peak Family Dentistry as her new dental home. Dr. Vizcarra’ s current and past professional activities include working as a volunteer to provide dental care to underserved children and adults in settings such as homeless shelters and clinics in the U.S., Central, and South America. In more recent years, Dr. Sara has dedicated herself to residencies focusing on helping her patients that suffer with TMJ disorders and Sleep Apnea. After years of diagnosing and treating patients, she was able to become part of the American Board of Craniofacial and Dental Sleep Medicine, which she is now a Diplomat of. 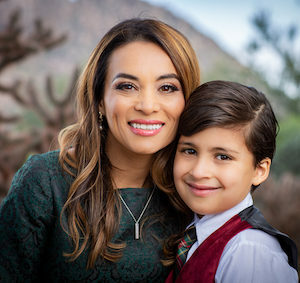 At home, Dr. Sara is wife to proud mother to “little” Luis. She enjoys being active by jogging, hiking, lifting weights, salsa dancing and yoga; even more so, she loves spending time with her family.